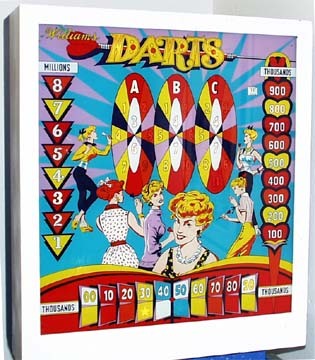 'Darts' is the name of a pinball game made by Williams in 1960. I picked up two of these machines on October 17, 2000, both of which were in pretty sorry shape. Neither worked, or were even close, but it was a great deal of fun putting them back into shape. The better of the two I kept for my own collection, and I gave the other to my parents as a Christmas present. This game features lightbox scoring, which was practically abandoned by this time. You had to add up the lit values to figure your score. 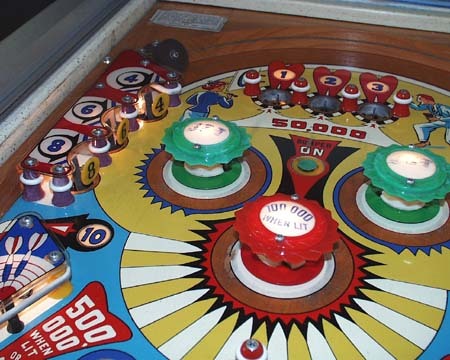 It also has a 'gobble hole', which is a hole in the playfield through which a ball can (ond often does) drain. This is a feature that disappeared by the mid-60's. It has a manual ball load also, which accounts for the 'extra plunger' on the front of the machine. What perhaps makes this a significant release is the fact that this was the first game to have metal rails, rather than finished wood. The rails are aluminum, instead of the stainless used ever since, and it is textured, which makes cleaning a much larger chore. 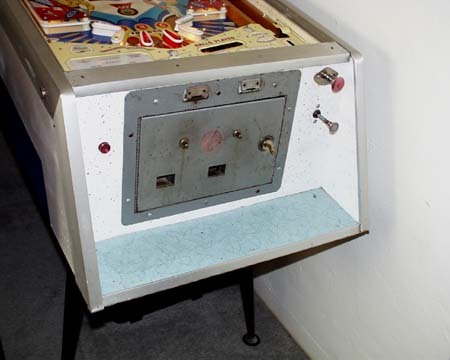 Williams also experimented with a new 'forward-looking' cabinet design for this model and very few others in 1960, which had a shelf directly in front of the player for placing drinks, and had a built-in cigarette holder, and the machine also feature 'furniture-legs', instead of the more functional corner legs used previously (and since). The design was NOT well-received, and was quickly abandoned. Notice there are no scoring reels.. Do the math! 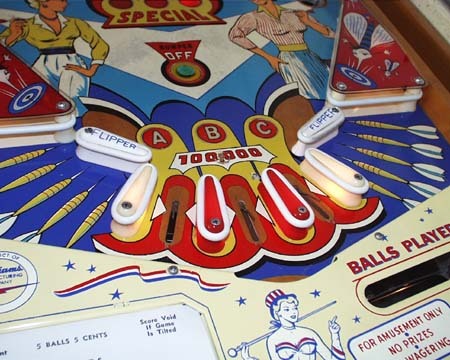 Some playfield detail of Darts. 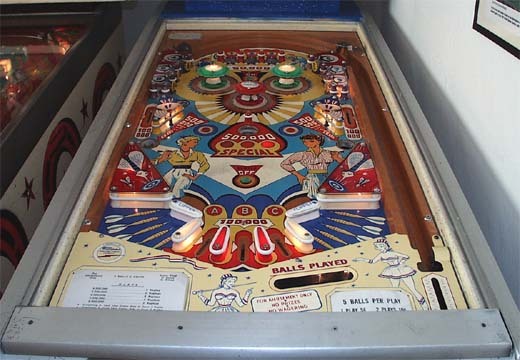 It has the shorter 2" flippers, and an unusual lower playfield in that the flippers are set well apart with three outlanes in between, but without any outlanes on the sides. The mark on the playfield just above the 'B' outlane is where some idiot had installed an extra post to prevent the ball from draining. I guess he sucked at the game, and needed some extra help..